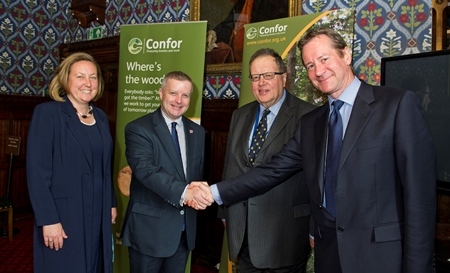 A new parliamentary group has been established to promote the UK forestry and wood-processing sector. The All Party Parliamentary Group on Forestry (APPGF) will work to highlight the urgent need for greater investment to increase levels of sustainable forestry. Forestry and wood processing currently supports 2.5% of the UK economy and three-quarters of a million jobs. It is projected that with increased investment, an additional 7000 jobs could be created in rural areas and increased planting could mean that by 2050, forestry alone could decrease 10% of the UK’s annual greenhouse gases emissions. “The need for increased levels of sustainable forestry and support for the wider forestry and wood processing sector has never been more important. The sector needs a secure long-term supply of timber, and woodlands need to be managed responsibly to protect them from climate change and pests/diseases.